I made this blanket in the summer for a friend whose sister was having a baby. Her request came shortly after my Deramores Blog Award win, so I had lots of lovely new yarn for her to choose from, and for me to play with. 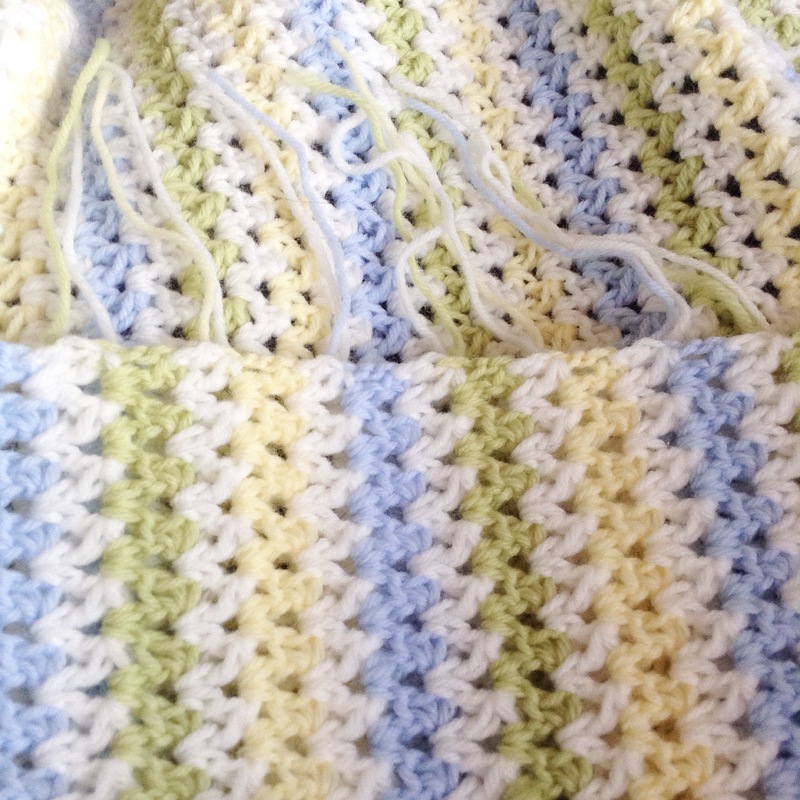 She opted for these lovely colours from the Deramores Baby range – Apple Green, Sky Blue, Primrose Yellow and Ivory. The yarn, a nylon-acrylic mix, is incredibly soft and lovely to work with. I’ve called it the Spring Field Blanket because that’s what the colours, and the yarn names, remind me of. The blanket turned out beautifully and was mainly made on the side of a football pitch due to Matey’s training commitments. 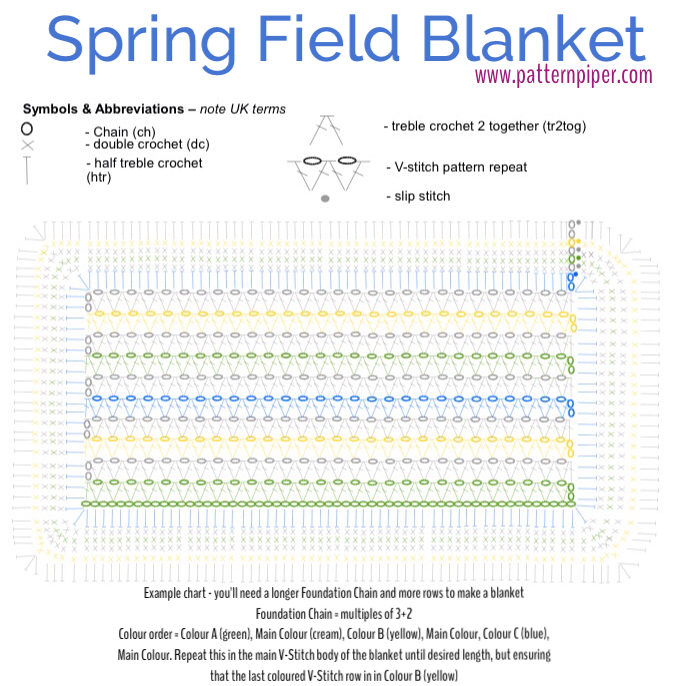 If you fancy making a Spring Field Blanket yourself the pattern is below and I’ve even attempted a (badly drawn) chart too (still getting to grips with that drawing software). The whole thing can be downloaded in a handy PDF at the bottom of the post – this is to make up for a notable blogging absence due to my kids having busier lives than me, but still requiring me to drive them everywhere. This will probably continue for – I don’t know – at least the next 7 years until they are both old enough to drive. But then they probably won’t be able to afford to – so who knows really! Row 1: In Colour A (Green) 1tr in 3rd chain from hook, *chain 1, then begin tr2tog in the same chain, skip 1 chain and then finish the tr2tog in the next chain*. Repeat from * to * until the end finishing your last tr2tog in the final chain. Turn. Row 2: In Main Colour (Ivory) Chain 2, then begin 1tr in the next chain space (the chain between the first V stitch on Row 1), *chain 1, then begin tr2tog in the same chain space and finish the tr2tog in the next chain space*. Repeat from * to * until the end finishing your last tr2tog in the final chain. Turn. Continue following this pattern (Colour A, MC, Colour B, MC, Colour C, MC, Colour A, MC, Colour B, MC) until the blanket is the desired length. Make sure your last coloured row is in Colour B (Yellow)and then repeat row 2 in the Main Colour. Border Row 2: In MC chain 1 (doesn’t count as a stitch), dc into each stitch, with 3dc into the corner stitches, all the way around the edge of the blanket. Slip stich into the first dc. Border Row 6: In Main Colour repeat Border Row 1. Beautiful blanket! The colors and stitches together are perfect. Just to double check, when I see “triple crochet” in UK terms, I would do a double crochet in American terms…UK “double crochet”, American, single crochet…correct? Thank you for this gorgeous pattern…I can hardly wait to make it…I am planning on a large blanket for my queen sized bed. Hi Rose, thank you for such a lovely comment. Yes, you’re absolutely right with the U.K. to U.S. conversions. I hope you enjoy making your blanket and I’d love to see pictures when it’s finished. Never mind…I scrolled up to the diagram and saw that these are UK terms. Sorry for the trouble. No problem Lee Ann. I hope you enjoy the pattern and I’d love to see you’re finished blanket. I’d love to know, how did you discover my website? I know that someone, I assume in the US, has shared my pattern on Facebook but I don’t know who. I’d like to be able to thank them if possible. Thank you so much for sharing your lovely pattern! The colors complement the stitches nicely. I am almost done with a Christmas present afghan, and I think your pattern will be the next one in the line up! :-). 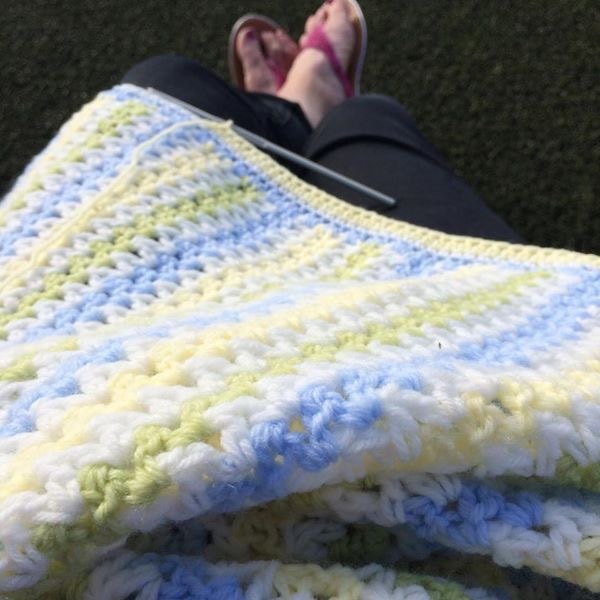 I’m so happy to have found your pattern in my crochet group, shared by Kim Guzman! Happy Hooking to you! Thank you Julie! I’m so pleased you like the pattern and the colours. I hope you enjoy making your blanket. And thank you for letting me know how you found the pattern. Happy hooking to you too! Hi Sue, thanks for letting me know where you found the pattern. I hope you enjoy making your blanket. Ooooooo! 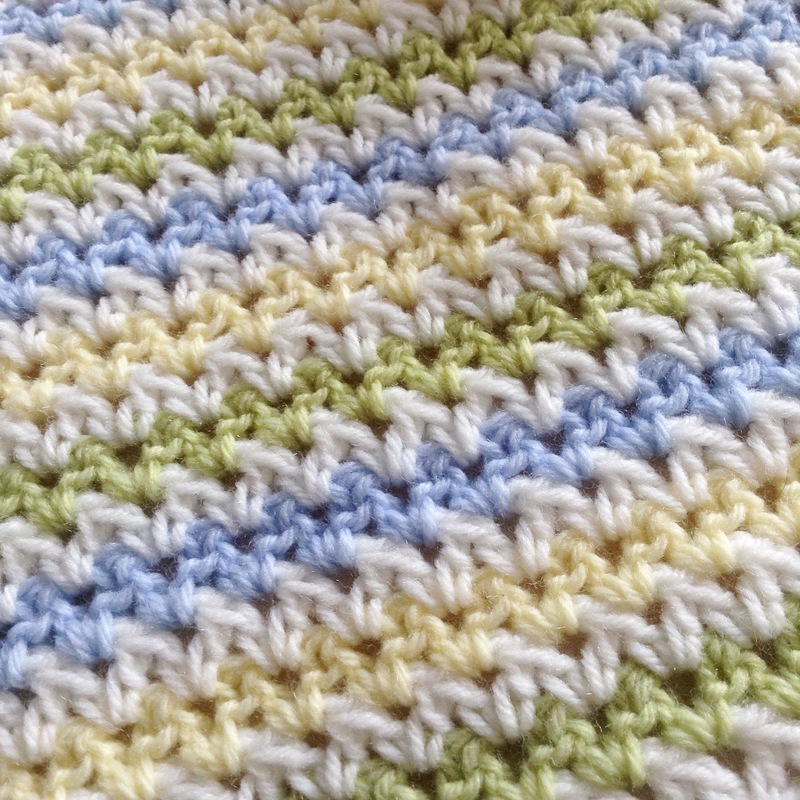 I am, just now, crocheting the border of a sofa nap blanket …..and I came across yours and said “Eureka! That’s my next project!”. It’s lovely, simple and unfussy and will work up beautifully in my favorite 100% cotton Sugar ‘n Cream yarn from Lily. I’m going to make the body one solid color with a contrasting color for the border. Thanks so much for posting the pattern and the lovely pictures. If I remember correctly, I came to you by way of Kim Guzman. 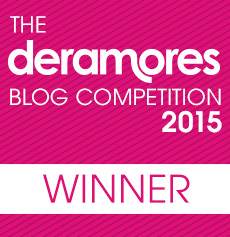 I subscribed to your blog and look forward to seeing more of your lovely work! I love this pattern. I’m in the US so I’ve used those terms. I also used a larger hook, a 4.25 mm or size G hook. Most of my yarn is Caron Soft and Simple. I’d like to know the finished dimensions of your baby afghan. My color repeats are 5 inches so I’m making it either 35 inches, then adding the border, or 40 inches, then the border. Thank you for such a great easy to understand pattern. Hi Rae, I’m so glad you like the pattern. I’m afraid I can’t recall the finished size of my blanket – sorry. I’ve heard that the Caron yarns are lovely to work with but I haven’t used them yet. That’s a brand to add to my “Yarns to try” list. I have worked “V” stitch patterns. This is a little different and interesting. Other patterns have the “V” worked in one stitch at a time, not worked over two chains. Found this on Pinterest on Facebook. Hi Cheryl, I love this way of working the V stitch. It’s so quick! I’m an impatient crocheter so the speedier the better for me. Thanks for getting in touch.